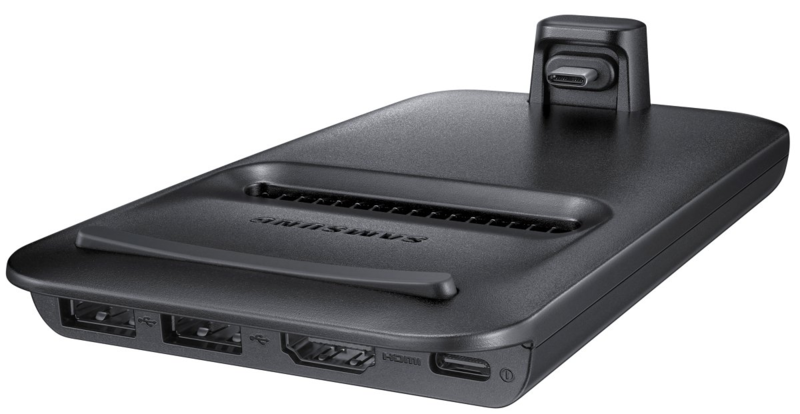 Samsung introduced the DeX Station alongside the Galaxy S8 last year. For those unfamiliar with DeX, it's a dock system that enables you to project a desktop experience to an external monitor. Just one day after 2018 began, Samsung registered 'DeX Pad' as a trademark in Europe. Now we have our first look at the DeX Pad, and while it's not a looker, its purpose is to turn your Galaxy phone into a touchpad. The DeX Pad is not nearly as cool-looking as the DeX Station. It basically looks like a portable battery bank with a couple more extrusions and holes. But the purpose of this is to get the phone to lay flat so that it can be used as a touchpad with the DeX UI. All of the ports (two USB, one HDMI, one USB Type-C) seem to be intact from the DeX Station aside from an Ethernet port, which could be on the side and not photographed. There's a vent ensuring the phone won't get too hot, as well as a pad that the top of your phone can rest on so that nothing gets scratched up. The Type-C connector and open design ensure compatibility with all Samsung flagships from the Galaxy S8 onward. We also get a look at the Galaxy S9 itself plugged into the DeX Pad. 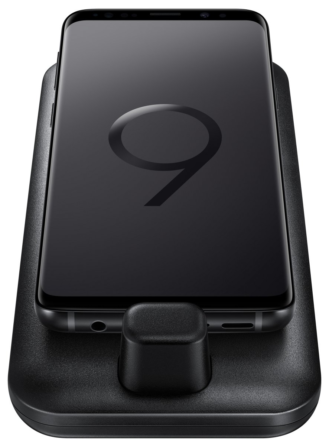 There's not much to see here that we didn't already know, but at least we have more confirmation that the Galaxy S9 will be keeping the headphone jack. The speaker design is also a bit different than what we're familiar with. We're expecting to see both products announced at MWC later this month.